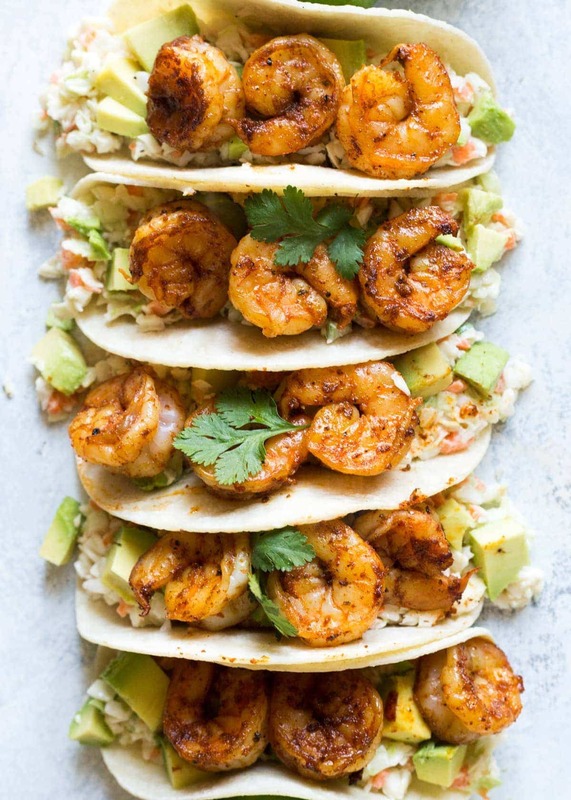 Shrimp Tacos – the perfect dinner for Taco Tuesday or any day of the week! They are fast to whip up, the shrimp marinates in Homemade Blackened Seasoning and is then quickly cooked in a skillet. 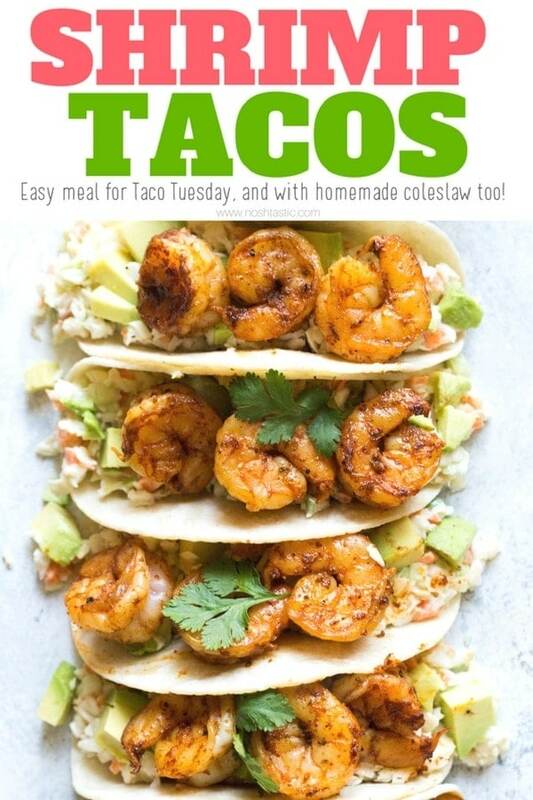 To really amp up the flavor of my shrimp tacos I’ve also added a homemade coleslaw for you, it only takes a few minutes to throw together and is dairy free if you use only mayonnaise. I also served them with some fresh chopped avocado. Pick the best shrimp you can find, I use Gulf Shrimp and avoid where possible any frozen shrimp that is farmed or has been frozen with preservatives such as sodium tripolyphosphate as they can leave a nasty taste on the shrimp. Use a well seasoned non stick or cast iron skillet to cook your shrimp, if not you may find you are scraping your shrimp in pieces off the bottom of the pan. I use corn tortillas to serve these with and I always warm them first in my cast iron skillet, they taste much better that way. you can make the slaw ahead of time and keep it in the fridge for later. If you want to prepare the avocado in advance just make sure you toss it in a little lemon or lime juice to stop it from oxidizing. 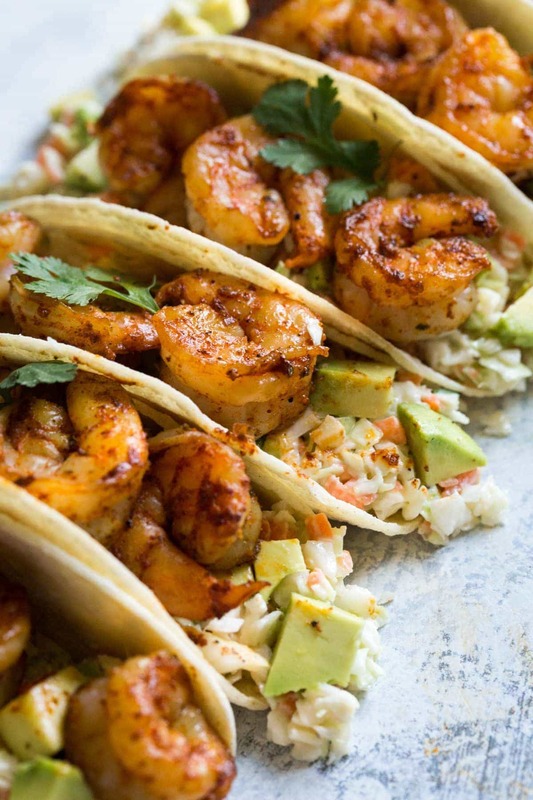 What is a Good Side Dish for Shrimp Tacos? I like to serve my Shrimp Tacos with a nice Coleslaw which is made with shredded cabbage, green onions, mayonnaise, apple cider vinegar and a sprinkling of celery seeds. I also add in some chopped fresh avocado and a few cilantro leaves to my tacos. How Many Calories are in a Shrimp Taco? My Shrimp Tacos have 258 calories per serving size of one taco. Calorie count may vary depending on the brand of mayonnaise, tacos and size of avocados used. 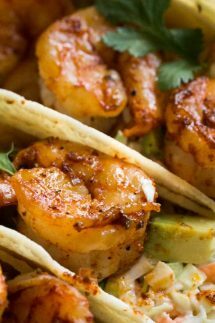 Easy Shrimp Taco Recipe you'll love! Mix shredded cabbage, green onions and the mayonnaise, apple cider vinegar, and a tiny sprinkling of celery seeds to a bowl and mix well. mix the shrimp with the blackening seasoning and let sit for 30 minutes.